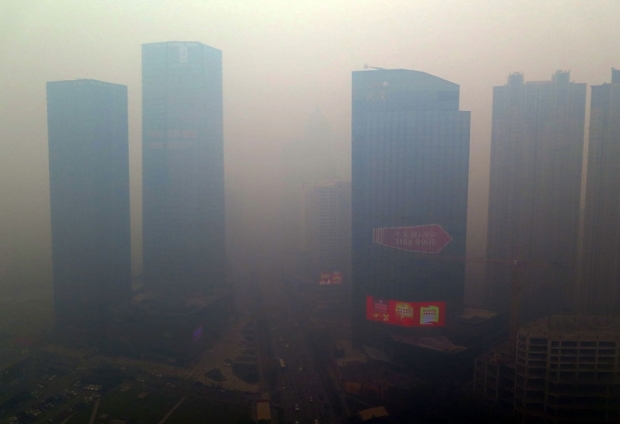 Shenyang, Liaoning province, blanketed with dangerous acrid smog on November 8, 2015, after levels of the most dangerous particulates reached almost 50 times the limit deemed safe by the World Health Organization. In the world of Chinese air pollution, there’s a new kid on the block. Shenyang, the northeastern stronghold of heavy industry and manufacturing since the Mao era, last week saw its levels of PM2.5 pollution shoot past 1000 and register a whopping 1400 on some monitoring sites. Beijing flirted with PM2.5 levels this high two years ago, triggering a national outcry and calls for government action and eventually leading to Premier Li Keqiang to declare a war on smog. Why did Shenyang get so bad? With hundreds of farms burning the crop stubble in their fields, spewing dangerous amounts of fine dust and smoke in the northeastern provinces, cities like Shenyang are edging Beijing out of smog headlines. Chinese netizens dealt with the news by blowing off steam on social media. The moment I pulled up the curtain, I thought I’d gone blind. Beijing humiliated Shenyang with a snowstorm, Shenyang slapped back with smog. I rode my motor scooter to work and felt like I was in a plane, flying through clouds. The greatest distance is when I grab you by the hand on the street, but I cannot see your face.